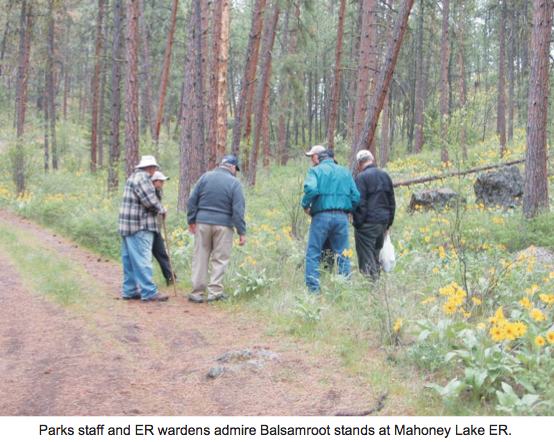 On May 13, seven Ecological Reserve Wardens (over 50% of the total) and four Parks staff in the Okanagan Region spent a slightly damp, but valuable and enjoyable day visiting ER 130, Mahoney Lake southwest of Penticton, and ER 100, Haynes Lease east of Osoyoos. While at Mahoney, we also visited the prescribed burn carried out on about 22 ha in March and April in the White Lake Protected Area immediately to the west of Mahoney. This was the second such field trip, and Sara Bunge, a Senior Ranger who has organized both, started the day with a short presentation on last year’s trip to the Kelowna and Vernon area. Some of the people present had not been on it, so it was a glimpse at two other ERs, Cougar Canyon and Campbell Brown. Wildlife Biologist Orville Dyer followed with a presentation on some key Threatened and Endangered plant species in the Okanagan and Similkameen. The discussion went beyond plants to other species in these categories. Wardens were able to provide a few sightings to Parks that were new to their records. Websites for tracking and reporting SARs were noted, which will be very valuable to have. looks quite open. Along with our annual Regional meeting, these field trips are a way for wardens to learn about other ERs in our Region; their current ecological situation, management plans, and any research carried out in them. It is also a chance for Parks staff to discuss a particular ER ‘on the ground’ with the warden and with input from other staff and wardens. In this case, it was also a chance for two new Senior Rangers to visit Protected Areas new to them. I highly recommend these field trips to other Regions and wardens. We thank Sara, Mark, Alysia, and Erin very much for their interest and willingness to take time in very busy schedules for these trips. My thanks also to the wardens, some who come from a fair distance and on a weekday. Another field day is tentatively planned for next fall, likely to some ERs in the north of the Region.